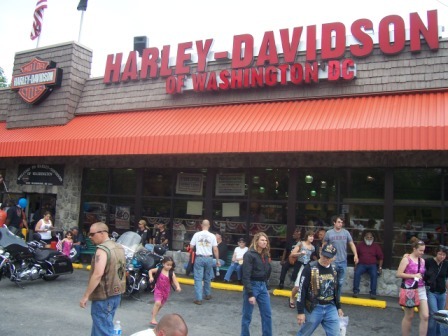 Last year we visited the annual Memorial Day pin stop at Harley-Davidson of Washington DC in Fort Washington, Maryland – home of Fort Washington HOG Chapter. Then we crossed the Potomac River and went up and down the George Washington Parkway. From the parkway we pulled over at a scenic overlook and took pictures of the fort in Fort Washington, Maryland. Click here to see the post about that trip. 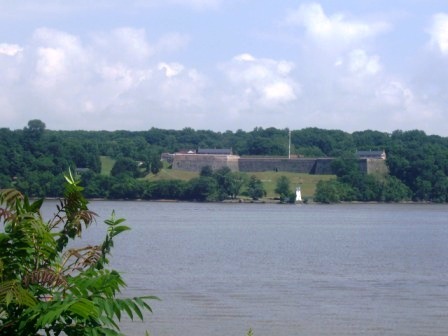 The fort was erected to protect our capital from attack via the Potomac river. Click here for more historical information about the fort. 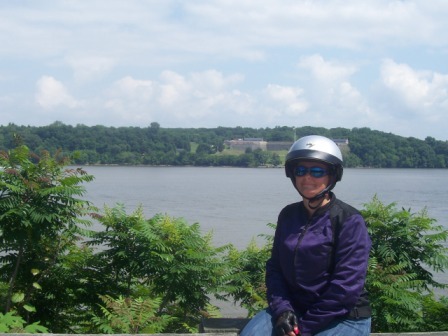 Almost a year later we revisited Harley-Davidson of Washington DC and then the fort at Fort Washington which is only five minutes from the dealership. Here is the view of the scenic overlook from atop the fort. Here are also views of Washington DC from the same vantage point. The fort was very cool and if you live in the area you should check it out. We live 2.5 hours away so it made for a nice ride. I was testing out a new route to be used next month for the 2011 Patriot Tour. We got off Rt 301/50 in Annapolis at Rt 2 which is the same exit used to visit Harley-Davidson of Annapolis. We followed Rt 2 which is Solomon’s Island Road and took a left traveling east on Rt 214 and then took a right traveling south on Rt 468 Muddy Creek Road. These are backroads that got us past a lot of congested busy roads. At the end of Muddy Creek we took a right on Rt 258 Bay Front Road. I won’t outline the rest of the way to Fort Washington but this is a cool way to get there even though it takes a little longer than some of the other ways. It is not easy to avoid traffic and congestion in the region around our capital. Click here to see all the Fort Washington pictures. They are pretty cool pictures if I do say so myself. A funny thing happened between the dealership and the fort. We stopped for pizza and as we parked our motorcycles in the parking lot a man walked toward us. He had just come out of the pizza place and proceeded to ask the world’s dumbest question: “Are you motorcyclists?”. Imagine me and Diana each on our Harleys wearing leather chaps, protective jackets, Hi-Viz vests, leather gloves, riding boots and helmets looking at each other wondering what to say. So then Mr Rocket Scientist follows up with another zinger and asks: “When was the first time you were injured?”. We were way to nice to this guy. After the fort we followed Rt 224 and 6 which was the long way to get to our motel in La Plata. This road went through some dense woods and for awhile I thought I was in a different part of the country. These roads are part of a route in the Delaware/Maryland Moto-Map. We saw a deer standing on the road and took it slow after that. I went to point out a road kill with my foot only to find out it wasn’t killed. It was a live one just hanging out in the road. Surprised me when the squirrel scurried away. We got to La Plata in need of gas and food. We filled the bikes, checked in to our room and walked to dinner. Went to bed early to get ready for our Ride Like A Pro class with instructor Dave Russell of Ride Like A Pro Maryland.